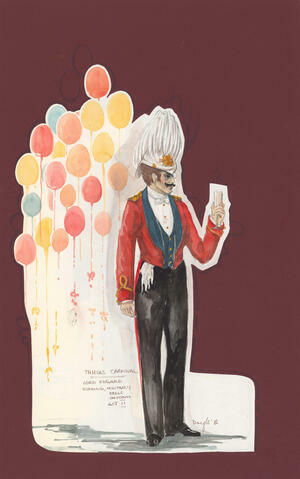 Item is a watercolour sketch of a costume design for Dalhousie Theatre's 1986 production of Thieves' Carnival. The costume is for a character named Lord Edgard to wear in act II. The sketch shows a male figure wearing the costume with balloons in the background. The sketch is cut out and mounted on a dark red matboard. There is a second sketch underneath the first one, with a design for Lord Edgard's evening suit which was not used. Sketch is detached from matboard.